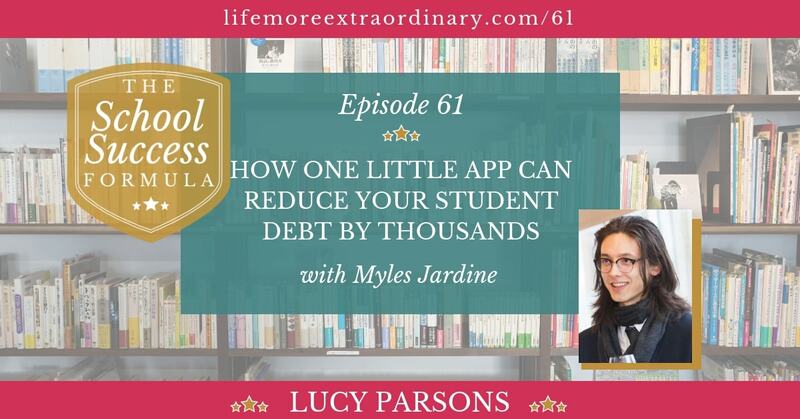 Today I talk to an enterprising man who, dismayed by the potential debt he would incur by going to university, began to look into alternative funding methods. He now shares what he found with students all over the UK who are looking to go to university but don't want the associated debts. Myles applied to university in his last year of school and was lucky enough to be offered the place, but fees had just trebled from £3000 per year to £9,000 per year. He calculated that including living expenses, he would end up graduating with a debt of around £50,000. Worried about the debt that he would incur, he decided not to go to university. Later, he discovered that there actually other sources of funding available for aspiring students like him. In fact, there are thousands of scholarships, grants, and bursaries available to help students pay for their tuition fees and living expenses. The problem is that they're usually poorly publicised and it can be extremely difficult to find information about them. Myles came up with a solution that enables students across the UK to access up to £85,000 worth of scholarships each. 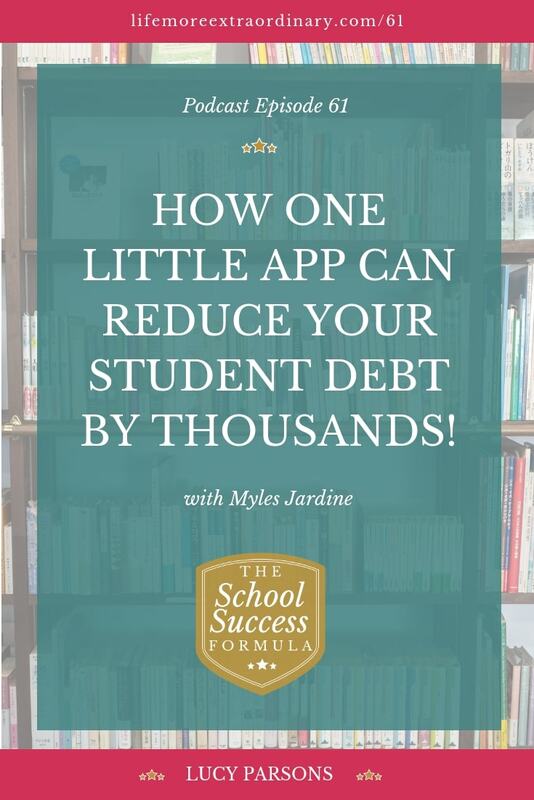 Lucy: Welcome to the school success formula, Myles Jardine. Myles: Hi, Lucy. It's great to be here. Lucy: Great to have you here. So can you start off by telling us a little bit more about your own story and the general financial picture for students going to the university in the UK at the moment? Myles: Yeah, absolutely. Well, when I was in high school applying to my studying for my A levels I was applying to go to university and the tuition fees in the UK recently recent to £9,000 a year, which is an incredible amount of money, especially considering before it was £3000, before that it was £1,000, before that it was free. So I ended up calculating that me and my friends will be graduating with around £50,000 in debt, which is a hell of a lot and that terrified me. I ended up turning down my university offers and taking a gap year really to try and figure things out because I couldn't reconcile taking out that amount of debt for an education. And it was during my gap year that I discovered the concept of scholarships, which I'd never heard about until that point. Whenever I asked my teachers before how they would fund an education like that, everyone told me to take out a student loan and then completely forget about it, which to me isn't a responsible way to look at debt. Myles: And again, I couldn't accept it. So, um, yeah, I discovered the culture of scholarships. I started looking for them online and I realised that there was a lot of money available and it simply was very poorly publicised. It was very difficult to find as well. And I realised that, uh, I mean lots of it was um, lots of scholarships were out of date; lots of scholarships, was just very difficult to find buried in company websites and university sites. And there's eligibility criteria involved as well. So you have to be from specific backgrounds to get certain scholarships and so you can search for thousands of scholarships and be not eligible to apply for the vast majority of them because, um, because of your eligibility criteria. So I realised that if you could narrow down the scholarships to your specific circumstances, that you would save a hell of a lot of time and you would make, more importantly, scholarships accessible to the vast majority of people because you would make it easy. So that's where the idea for Grant Fairy came from. Lucy: Okay. That's amazing. So, have you been to university or has this project taken over? Myles: I haven't, no. I, um, I started on the project, I thought it was going to take er, it was going to take a weekend – two at most. It ended up taking up, so far, about a year of my time and it's about 15 to 18 hours a day working. So I haven't had time yet, but someday I'd probably like to go and have a stab at university. Lucy: Okay. So you've explained to us that you found out all about the scholarships and that you realised that it wasn't a simple process for people to a) find them and b) find the ones that they were eligible to apply to. So what is your solution to this problem? Myles? Myles: Right. So Grant Fairy is a scholarship system which helps students find scholarships and basically fill out a very short profile and it takes about 20 seconds and they basically they choose that they can look through all the courses available, all the institutions in the UK and they look at, they can look at some really nice granular data with that as well to help them make their decision about where they want to study. So things like student satisfaction rates, graduate outcomes, projected salaries, things like that. It's really valuable information. And from there you can choose that course and you can find funding specific to that course which you are eligible to apply for. And typically we find user eligible to apply for more than £85,000 in scholarships. Lucy: Okay, that's amazing. So what are these scholarships? Who makes them available and you know, give us some background on, on all that. Myles: Okay. So scholarships come from a, um, from a lot of different places. You get them from corporates, you got them from charitable foundations, you get it from universities as well, trying to bring people in. But we very much don't have a scholarship culture in the UK, in the US, for example, scholarships are very much known about because tuition fees are incredibly high over there and for a long time they've had this time to develop a scholarship culture, whereas in the UK we've only had this problem with tuition fees very recently and so it's still very early days and people don't know about this money which is available to them. So uh, one of the issues with these funds, and I've talked to them personally, is that they struggled to give this money away because people in the UK don't think to apply to it. And it's also in many cases it's not the, not the trust's job to promote this information; they simply allocate it and you get these very small funds as well. So it becomes a very difficult thing to try and promote this free money online when it's just being like lost out in the ether. So I'm getting it in, unifies all the scholarship information in one spot to just make it easier for people. Lucy: Okay. That was amazing. So who are the grants available to? Is it just the kind of clever, sporty musical types and um, I, yeah.. How do you know if it's even worth you pursuing this? Myles: Okay. So this is one of the biggest questions we have and one of the biggest misconceptions around without scholarships as well. Uh, scholarships are available for absolutely everyone. It's really important that people are aware of that because the vast majority of people in the UK and people even higher up in education immediately think, oh, it's just for the, the Einsteins and Stephen Hawkings of the class. It's just for people from incredibly disadvantaged backgrounds, and that's not the case at all. It really isn't. Anyone who goes onto the app on average can apply for more than £85,000 in scholarships. It's absolutely everyone. You can get some really weird and wonderful scholarships; ah, things like scholarships if you're vegetarian or scholarships if you're a zombie killer, right? This one's for even if you have the last name, Graham or Menzies, they really are for absolutely everyone. Lucy: That's crazy! Okay, so if your last name's Graham, get on there and get some free money. So you said it takes 20 seconds to fill out the profile on the app, erm, presumably there's a bit more to do once you've found which… Which scholarships might apply to you? Myles: Yeah, absolutely. So, uh, you can go through your list, you can, you can take a look at what scholarships are available. Each scholarship has a different application process. So it really depends. Sometimes you fill out a form, sometimes there's an interview, sometimes it's a short essay to, for the people distributing the money to get a feel for your personality and sometimes they ask you what will you spend the money on? Other times it's fixed. It really depends on each scholarship and uh, the time it takes to apply for them depends, I suppose, on how quickly you work, but um, they, they tend not to be incredibly long processes because if you think about it from the trust side as well, they don't want to be trawling through a 20 page document to find out what they need to give money to someone. Lucy: I know when I was at university, um, I, there were various different things available and like there was one for people whose parents were under a certain income threshold and my, my parents were under that threshold and I applied for that and I think I gave me, I just literally have to provide the financial proof and that was all and I think they gave me £750 a year for three years. And then my college had travel grants and I got two travel grants to go away two summers in a row and literally, I just said, you know, I basically went on holiday to America for two weeks. Because I was studying geography. I was like, well, travel anywhere – it's justifiable when you're studying geography, but I probably got two or £300 two summers in a row just through the travel grant. And then there were book grants as well, so…Yeah. There's loads of different things. And I know the village where I live now, when they sold the school house, where the head teacher used to live when they sold that in the 1970s, the money from the proceeds of that sale went into a trust and now people in the village can apply to it for books or for musical instruments. So, you know I've had help from that over the years as well. Myles: Yeah. There's just such an incredible amount of money to give away. And then again, the people that I talked to from these charities actively wanted to give the money away. It's not like they're hoarding it and they don't want…They don't want anyone to take a look at it. It's they actually want to and they're desperate to give money away, they're so frustrated because they want to help people. But if people don't apply then they can't, of course. Lucy: Yeah. So how do people get access to the app, Myles. Lucy: So it's free for people who are in the sixth form. What about for everybody else? Myles: Okay. So for everyone else it's two pounds a month, but I'm offering a everyone listening to this podcast, a special 50% offer deal. So you get it for one pound a month. Lucy: Okay. Well that's really generous with you. Thank you so much. Males. I would just say that's a no-brainer to spend that money if you can potentially get tens of thousands for absolutely free. And it just costs you a few pounds, like if you're subscribing for a few months. Um, and the other thing is that you make it available to sixth forms, absolutely for free. Is that right? Myles: That's right. Yeah. So we're working with over 300 sixth form colleges across the country and we supply to them for absolutely free to their students. So what happens is the, um, the careers advisor or the head teacher reaches out to us directly at grantfairy.com and we set them up with a school account. Myles: Okay, that's brilliant. So if there are teachers listening and your school's not already hooked up with Grant Fairy, then they should make contact with you through the website. Myles: Right. Completely free, and it's very, very easy to set up. There's pretty much no maintenance to it at all. It's a five minute thing and you're done. Lucy: Okay. Amazing. So sixth-formers listening, you should be able to get it for free if your school hasn't already got it, talk to your head of sixth form or your careers advisor and get them to contact Myles. And if you're at university then, or a parent, then you can get access for just one pound a month using the voucher code as well. There's a link in the show notes for today's podcast episode, which you can click on to come and sort that out with you, isn't there? Lucy: Okay. So what are your hopes and dreams for the app in the future? Myles? Myles: Well, uh, my, my hope is that the, my goal is to make the app nationwide, uh, as soon as possible. I want to make it so that scholarships become a part of the university application process. So when people start to think about where they go into university, they think where am I going, what am I studying? And then lastly, how am I going to pay for it? Because it's an incredibly important question that people need to be asking. It needs to become part of the discussion today and really not enough people are talking about it. Lucy: Yeah, that's amazing. And yeah, do you see yourself doing this for years into the future or do you, are you going to disappear off and use it to pay for your own education? Myles: If I. The thing is, if it takes up so much time, I'm spending so much time on it every day I wouldn't be able to, uh, I'd be the one sitting at the back of the class and I'll be just working on the business instead. At some point if I, if I ever get some free time off, um, well firstly I'll catch up on sleep and then I'll maybe try apply to university and see how that goes. Lucy: Well, it's an amazing thing that you're doing, um, you know, giving this kind of financial access to so many people and to the education that we all deserve. So that's amazing. Thank you on behalf of everybody for giving up so much of your time and you know, putting the brakes on your own education to make it happen. And before we finish off, I know you've got a story. I know it's early days for the app, so you haven't got loads and loads of stories of successful people, but um, what, what's the most amount that anybody's found through… gained through the app so far? Myles: Yeah. Recently actually we had our, um, we had a success story and they might get only applied for one scholarship and they managed to get £1500 from it. They sent me a message on Twitter, things like that saying I can't believe that… I can't believe I got it. And just really is great to hear those kinds of stories because it proves that it's possible and proves that you can get the money. I think there's a lot of self-doubt when it comes to scholarships in the UK because they are such a new concept, people think I'll never get it. But the only way you can guarantee that you won't get it is if you don't apply. Lucy: Yeah, definitely. So we would really encourage people to get their sixth forms signed up for the app or if you're already at university, sign yourself up for the app for one pound per month using the link in the show notes, start applying for these scholarships because it is going to pay, you know, it's going to pay a lot more than a part time job if you actually, um, but you know, put a little bit of time into it and get it, get it, get applying for these scholarships. So where can people find you and download the app, Myles? Myles: Okay. So, uh, you can find the app itself in the App Store or the Play Store just by searching Grant Fairy in the search, you can also find me, you can find the website and the web app at grantfairy.com. I'm on twitter, I'm @MylesJardine on twitter, that's M-Y-L-E-S-J-A-R-D-I-N-E – its got an odd spelling to it. Uh, you can follow Grant Fairy on twitter as well and you can drop me a line by email and say ‘hello'. Lucy: So I would love it if anybody downloads the app and applies for a scholarship or a grant and they're successful if you tweet both me and Myles to let you know about it, that would be amazing. So Myles is @MylesJardine and I am @LucyCParsons on Twitter. So is there anything else you'd like to add today, Myles? Myles: Um, I think just the main takeaways that I just really want to stress is that there is free money available and on Grant Fairy there's most people don't believe what I'm going to say, but there's roughly a billion pounds worth of funding opportunities available. Like you're not going to go short. And if you are a school, please contact me and I'll set you up with a free account today. Lucy: Fantastic. Thank you so much for coming on the School Success Formula. Take care. Myles: Thank you for having me, bye-bye.